With the pure graphite of the Caran D'Ache Grafwood range you can get the most out of shades of black. Grafwood pencils give a beautiful, velvety finish to your sketching and a balanced, weighty feel in the hand. A robust pencil with the quality to produce great subtlety of line and texture. Beautiful, velvety finish to your sketching. Balanced, weighty feel in the hand. Barrels colour coded for ease of selection. A robust pencil with the quality to produce great subtlety of line and texture. 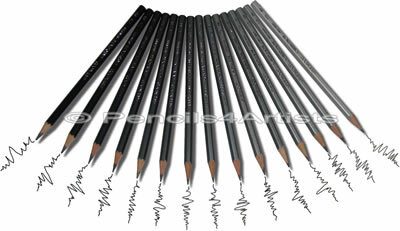 A set of 12 graphite pencils from across several of our ranges. Choose from Extra Soft, Soft, Medium, Hard and Extra Hard grade sets. Get the most out of shades of black with the pure graphite of the Caran D'Ache Grafwood range. 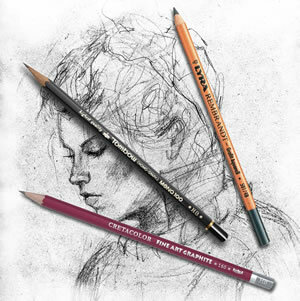 Grafwood pencils give a beautiful, velvety finish to your sketching and a balanced, weighty feel in the hand. 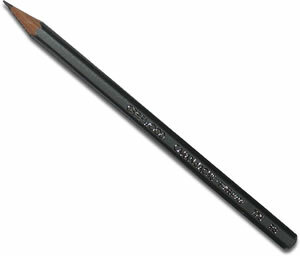 A robust pencil with the quality to produce great subtlety of line and texture.